Seton Hall Preparatory School, located in West Orange, NJ is a Catholic, college-preparatory school called to serve young men of diverse cultural and economic backgrounds. Firmly rooted in its Catholic identity, the school’s mission is to foster the spiritual, intellectual, social and physical growth of students in order to prepare them to meet the challenges of college and adulthood in a manner that embodies the values that this community cherishes. The Prep instills spiritual awareness, academic excellence, personal maturity, and social responsibility with a particular emphasis on service. 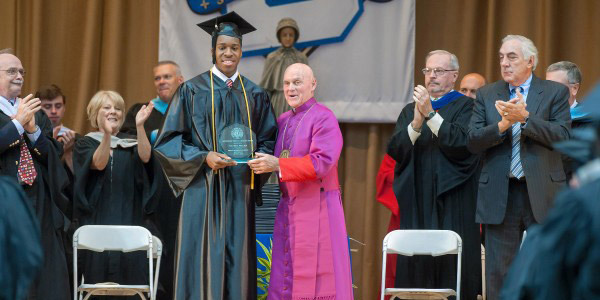 Each year approximately 950 young men receive an education and formation at Seton Hall Prep. To maintain excellence, Seton Hall Prep decided to build a new science center, develop further its 44-acre Kelly Athletic Complex and grow its endowment. Averill Fundraising Solutions has guided The Prep in its $25,000,000 “Generations” Campaign to fund these important efforts. Concurrently, Averill re-engineered the school’s annual fund and increased its fundraising revenue by 34% and participation by 16% over a two-year period. Averill President Robert C. Happy, Jr. has been a trusted advisor to Seton Hall Prep for more than twenty years. Bob has directed The Prep through three major fundraising campaigns that have enhanced The Prep’s endowment, constructed new facilities, and funded the purchase and development of the Kelly Athletic Complex.